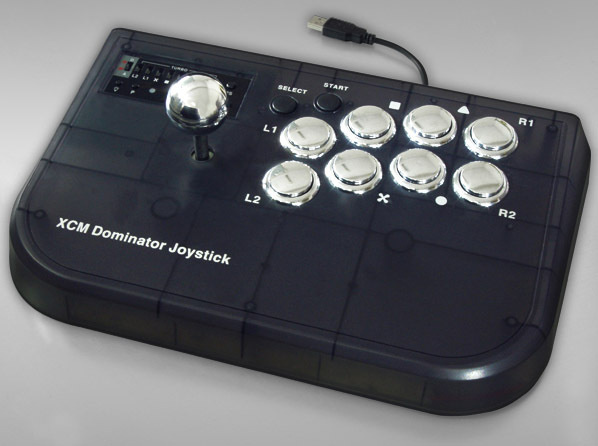 If you’ve been trying for 10 years but STILL can’t get your head around the idea of playing Street Fighter using a controller that only has four face buttons, here’s what you need – the XCM Dominator Joystick. Last time we heard from WowWee, they showed Ashley a robot at last year’s CES. I guess they decided that there’s not much money in robots, because this year they’ve got a bunch of cheap, tiny, but remarkably attractive projectors instead. From left to right, there’s the “Stick”, which takes SD cards, but also has some internal memory, the “Station”, which lets you both dock your iPod and display its contents, and the “Swivel” which has a 90° hinge, letting you project your videos skyward. It also packs a three-hour battery life, for those long sessions of lying on your back. No pricing or availability yet, beyond “2009”. Find more CES coverage here. Tempted? I sure am. 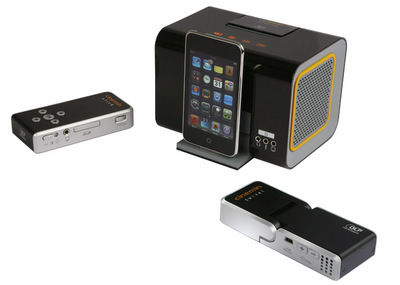 Related posts: Optoma Pico portable projector – pack 60 inches in your pocket | Toshiba pico projector – nice tech but is it totally useless? If I learnt anything from the second series of Heroes, it’s that people who turn stuff into gold tend to end up in an early grave. 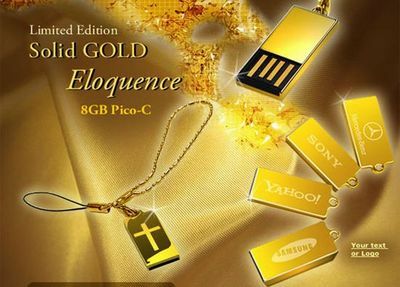 A cautionary tale for Super Talent, who make USB drives out of 18 carat solid gold. 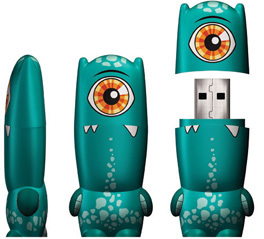 The Pico-C USB drive. Oh, they cost US$599, by the way. What do you get for that cash? 8GB of storage, 30MB/s transfer speeds (gold’s a very good conductor) and water resistance, in case you drop it in your $300 glass of champagne. The company will also etch anything you like onto it for no extra cost, like a pretty zebra, your primary school nickname (big ears), or maybe even your company’s logo. The whole thing arrives in a black velvet jewelery box with a certificate of authenticity and a gold keychain. I’ll say again – US$599. That’s £380. Yowch. Grab one on eBay and spraypaint it gold instead. LG has launched its Vaccine USB stick in the UK – the world’s first USB equipped with anti-virus and malware protection software. 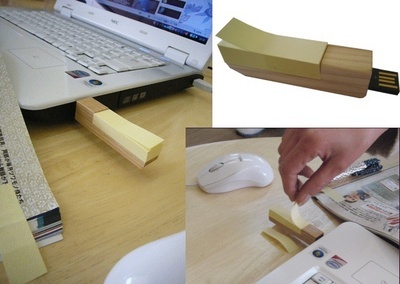 And it stores your files too. Mimobots are those USB memory sticks for the design-fussy amongst us, who just won’t accept a bog-standard job from Dixons. Normally coming in limited edition sets of just a few thousand, and even Star Wars characters, which Firebox.com will be stocking shortly apparently, a UK exclusive we hear, they’ve suddenly got a lot more attractive.